Ethiopia's London 2012 Olympic Games Marathon champion Tiki Gelana successfully defended her crown with a time five seconds slower than in 2012, but was made to work surprisingly hard writes Ken Nakamura. Gelana took off from the start and covered the first 5km in 15:52, a minute faster than last year. 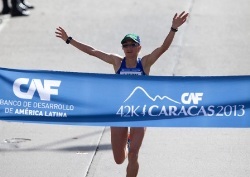 She led through 10km in 32:19, 30 seconds ahead of her 2012 pace. 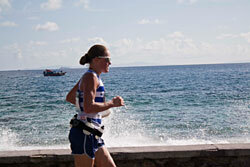 But New Zealand's Kim Smith slowly pegged her back, catching her at 12km. The pair then ran together until the last 600m, when the Ethiopian surged away to win by seven seconds. Her younger sister Aromas Gelana finished 24th in 1:13:39. Japanese filled 7 of the top-10 places. In third, Yuko Shimizu improved by nearly three minutes and fourth-placed Sakiko Matsumi by more than two minutes. The 62nd edition was a thrilling battle between Yuki Kawauchi and Kentaro Nakamoto, with the pair engaged in a head-to-head over the second half of the race, writes Ken Nakamura. Kawauchi, the fastest non-professional Marathon runner in Japan, surged at 28km, 33.3km, 36.4m and at 36.9km only to have Nakamoto, sixth in the London 2012 Olympics Games, cover his every move. Finally, with 1600m to go, Kawauchi surged again and shook off his rival, going on to win in a course record and personal best of 2:08:15. He eclipsed South African Gert Thys's 17 year-old record of 2:08:30. 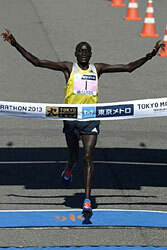 Nakamoto finished 20 seconds behind, also with a personal best but he is still yet to win a Marathon in his 10 outings. "I was hurting but I did not want to run a slow tactical race" said Kawauchi. "I fell short of my 2:07 target, but I am happy to run faster than Hiroyuki Horibata's time in Fukuoka" (2:08:24). The Beppu-Oita Marathon was one of the qualifying races for the Japanese team going to the 2013 IAAF World Championships. By contrast Nakamoto was visibly disappointed. "I knew it would come down to the final part of the race, so I tried to be ready for the one final surge. I am happy with my time but my goal was to win this race, so I am disappointed about that." The lead pack was progressively reduced from around 40 runners at 5km to just 15 runners by 20km. The halfway point was reached in 1:04:07. Seven runners passed 25km together in 1:16:01. Then at 28km, the cat-and-mouse battle between the two main protagonists began. After Kawauchi's first surge Nakamoto was the only runner to follow him. With 1.6km to go, after taking water for a final time, Kawauchi quickly opened up a 10m gap which gradually grew to a 20-second winning margin. Kawauchi ran the second half of the race only one second slower than the first half. 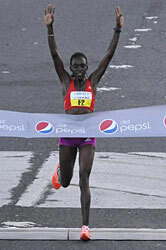 Lucy Kabuu ran the second fastest time ever, while Geoffrey Kipsang narrowly won a very fast race. Three men went under 59 minutes in a race for the first time, and four women went under 67 minutes for the first time ever. The women started on world record tempo (5km in 15:35; 10km in 31:18) then slowed slightly, while the men set off cautiously (5km in 14:04; 10km in 28:13) but picked up to run a faster second half (the second 10km was run in 27:50). Either way, the resulting times were equally impressive. Behind Kabuu, Priscah Jeptoo set a personal best by over four minutes and also became the third fastest in history, while Rita Jeptoo in third now takes fifth position on the all-time list. 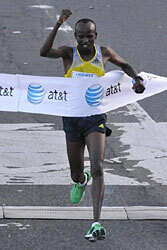 Kipsang's winning time was just two seconds shy of the 59:52 course record of Patrick Makau set in 2009. 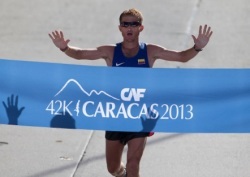 The third edition of the Marathon attracted 2300 entries, and another 5800 ran in the Half Marathon. 30 countries were represented. Overall participation has grown from 3500 in the inaugural edition to 5800 last year and 8100 this year — with a target of 12,000 next year. After finishing second two years ago, and just one second behind the winner — although in fourth place — last year, Julius Maisei got it right third time around, kicking clear with 3km to go writes Pat Butcher. A strong wind inhibited the pace with no pacemakers to take on the task Deribe Robi led for much of the second half. There were still a dozen in contention at 32km. Only when Maisei and James Mbugua joined him at the front did others fall away. The headwind meant that Dereje Abera's course record of 2:11:27 from last year was never remotely threatened. Like Maisei, Mbugua previously came third, and now second, but has never got top spot. Misiker Mekonnin Demissie had little trouble retaining her title just over half a minute slower than the course record she set last year. She always looked in control, heading the pack, until she broke away at 35km. In third place Kum-ok Kim won the 14th Asian Championships title, emulating her victory the last time it was held in Hong Kong, in 2008. The favourite, Ser-Od Bat-Ochir, also won the men's Asian title. The Mongolian clocked 2:17:56. In overcast and cool conditions Munya Jari ran the fastest-ever winning time in the 17-year history of the race, writes Norrie Williamson. Jari fought off a strong challenge from Samuel Pazanga in the second half of the race, using the short steep final climb at 39km to break free and eventually finish over two minutes clear. Jari sliced 31 seconds off Pazanga's previous course best set in 2010. Melanie van Rooyen, third in the South African Marathon championships three weeks earlier, passed Candyce Hall shortly after halfway to dominate the women's race. Samuel Kiptum outran Sibongile Duma in a hard fought half marathon race. The early leaders set off at a blistering three-minutes per kilometre, but as they inevitably slowed Duma opened up a 100m lead to pass 10km in 33:02. Kiptum and Micheal Mzobe, following at a more conservative pace, saw Duma's telltale looks behind as they closed him down. They passed him at 15km, (48:42). Kiptum appeared to have the upper hand, but Duma rallied again and it was only a final kick that gave the Kenyan the advantage on the run-in. Mzobe hung on bravely to complete the podium. Despite her veteran status Suzette Botha eclipsed younger contenders to win the women's race. In the inaugural 10km event Syiabonga Nkonde took top honours in a useful 30:09. 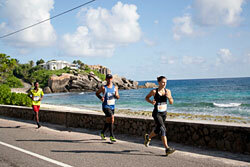 In all over 5000 runners took part in the three events. In cold and windy conditions Denis Kimetto ran a superb second half to set a new course record of 2:06:50 writes Ken Nakamura. The pack stayed together until 28km, after passing halfway in a modest 1:04:22. James Kwambai broke the race open with a 2:55 kilometre, followed by a 2:48 kilometre. His compatriots Kimetto, Michael and Bernard Kipyego, and Gilbert Kirwa followed. 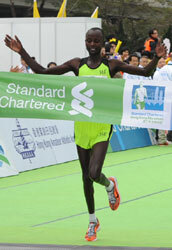 Kimetto then ran 30–35km in 14:20 to gain a lead of five seconds from Micheal Kipyego. He covered the next 5km in 14:35 and maintained his lead to the finish. Kazuhiro Maeda pushed hard in the last 10km of the race in pursuit of Japan's automatic World Championships qualifying time of 2:07:59. Although he passed Kirwa and then the flagging Kwambai in the final kilometre to finish fourth, he missed the target by one frustrating second. By contrast the women's race started briskly, with Kebede, Japan's Azusa Nojiri and Kenya's Caroline Kilel passing 10km in 33:31. After 17km first Nojiri fell off the pace and then Kilel, while Ethiopia's Yeshi Esayias, 16 seconds behind at halfway, joined Kebede just before 25km. They ran together for over 10km before Kebede pushed for home, finishing just outside the course record. Germany's 40-year-old Irina Mikitenko came in third. A record 36,201 runners entered the race. Sammy Kitwara took his fourth title while Joyce Chepkirui savoured her first as they completed a Kenyan double at the 16th World's Best 10km, writes Javier Clavelo Robinson. Kitwara astutely followed all the moves in what was initially a tactical race before covering the second half over a minute faster than the first to win in 28:42, the slowest winning time since 2000. 40-year old Luis Rivera took an early lead that grew to 40m before he was caught by a large African chasing group, who passed halfway in 14:55. Kitwara started to push ahead from 6km, recording a second half of 13:47. In the women's race Joyce Chepkirui ran the first half within a nine-strong lead pack after which she moved away to win her first title, improving on her second place last year. Out of 10,078 registered runners, 7882 started the race and 7813 finished (4796 men and 3017 women).